Mo FARAH filled in the single void missing from his prodigious CV at the Sainsbury’s Grand Prix in Birmingham yesterday with a world record of 8:03.40 in the two-miles. For the double Olympic champion, the Birmingham track proved a safe haven from the myriad distractions and debates that arose in the preceding days, amid his on and offline verbal joust with domestic rival Andy Vernon. His pursuit of a global mark was relentless with the Londoner ending ten seconds clear of Kenya’s Paul Koech. Titles, not times, remain foremost in his to-do list. “I will never give up,” the 31-year-old said. “I want to be able to know I collected as many medals as I can for my country, in years to look back and show my kids. That means a lot to me.” More, you sense, than getting dragged into unseemly rows with fellow athletes. “Whatever’s happened has happened, we’ve got to move on,” he added. “But at the same time I’m an athlete, that’s what I do best. Guy Learmonth has pledged to impress in his major championship debut after booking his spot at the forthcoming European Indoor Championships with seventh place in the 800 metres. With in-form Kenyan Jeremiah Mutai blasting clear, the 22-year-old Borderer pulled out a personal best of 1:47.38 to land the Prague qualifying mark. Kirsten McAslan will also relish a Euro berth, having earned automatic selection in the 400m with third place here in a time of 52.23 seconds, inside the qualifying standard. 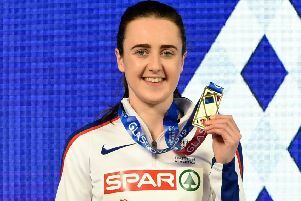 Laura Muir plans to opt for the 3,000 metres after taking sixth place behind Tunisia’s Habiba Ghribi, rather than attempting to match her 1,500m victory at the UK Championships seven days ago. Allan Smith, with a Euro spot wrapped up, won the high jump in 2.26m with fellow Scot David Smith fifth despite a lifetime best at the same height. Prague pentathlon hope Katarina Johnson Thompson took long jump victory in a UK record of 6.93m, while Chris O’Hare, fatigued from a long flight from Boston, was 11th in the 1500m.